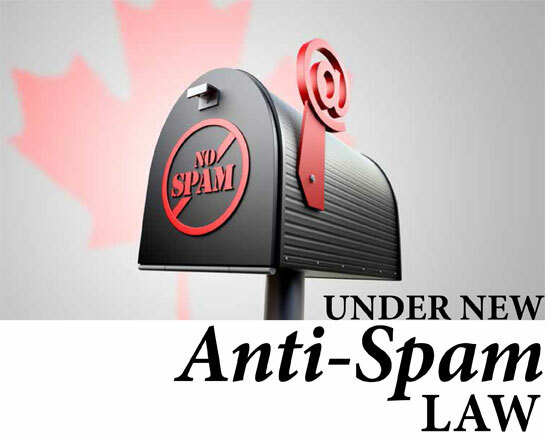 Canada’s Anti-Spam Law (CASL), which took effect on July 1, has wide-ranging implications for every business that uses email, social media or instant messaging to promote its products or services. The legislation applies to messages sent electronically that have a business purpose and covers one-to-one communication as well as mass emails, says Chad Finkelstein, partner, Dale & Lessmann LLP in Toronto. “It applies to all customers, prospective customers, suppliers and vendors with whom you communicate electronically,” he notes. CASL targets any electronic communication that could be considered to “encourage participation in a commercial activity.” Emails, text messages, instant messages and messages sent through social networks that have a commercial aspect will be considered commercial electronic messages (CEMs), and require express or implied consent, unless they are covered by an exemption. Express consent means that someone has given their verbal or written approval to receive emails from you. However, the onus is on the sender (i.e. the business owner) to prove they have that consent. Express consent is considered valid if it was obtained before July 1, 2014. After July 1, if you want to continue sending electronic communications to people who have not given you their express consent, you must first contact them by phone or regular mail to obtain it. Implied consent means you have a personal or family relationship with someone, or an existing business relationship. That means you have conducted some sort of business transaction with the email recipient (i.e. the recipient bought a product or service from you) at some point in the previous two years, says Finkelstein. Implied consent also exists if someone makes their contact information conspicuously available, such as on their website, without stipulating that they don’t want to receive electronic communications. An exemption exists if someone requests a quote from you or you are communicating factual information about a service or warranty. Registered charities have an exemption for CEMs that are sent to raise money and political parties and candidates are exempt if the message’s primary purpose is to solicit contributions. Penalties for violating CASL range from $1 million to $10 million; there will only be regulatory enforcement until July 1, 2017, after which spam recipients can sue the sender. Noting that the statute has a due diligence defense, Joanna Fine, a lawyer in privacy and data management with Toronto-based Osler, Hoskin & Harcourt LLP, says you should do everything possible to establish that you have assessed your email lists and updated your electronic mailing processes. Fine recommends reviewing your existing database to determine how you obtained each email address it contains. Is it for a current patient? Did it come from a business card? If you’re unsure how you got the address seek the person’s express consent. Review your current mailing list. Assess whether you have implied consent from those on it to continue contacting them electronically and whether you can rely on that consent under the new legislation. If you rely on implied consent, create a system to alert you when the implied consent period has lapsed. Otherwise, you will require express consent. Develop a records system to keep updated lists of those who have given you consent to send them electronic messages and a list of those who haven’t. an unsubscribe option that allows the recipient to stop receiving your emails. Unsubscribed recipients must be removed from your mailing list within 10 business days of their opting out. o Employers are responsible for spam sent by their employees. Educate your staff so they know and comply with the new rules. o CASL also imposes new standards for electronic messages to comply with Canada’s truth-in-advertising laws. Previously, to assess whether an email was misleading, you had to look at the entire email. With CASL, each of its elements – the subject line, for instance – must be assessed independently. o CASL also affects how you contact referrals. You are only allowed to send a single message to a prospective client. It must include the full name of the individual who gave you the referral, and the identification and unsubscribe requirements mentioned above. if you use email lists from third parties. For additional information, contact CFIB’s Business Resource Department at 1 888 234-2232. While its counsellors are well informed about the statute, CFIB cannot provide legal advice. To ensure your business is compliant, they recommend you seek advice from your lawyers. This entry was posted in Managing Your Business and tagged anti-spam, canada, canadian, casl, consent, electronic communications, email, legislation, spam by Envision Magazine. Bookmark the permalink.